A Shakespearean adventure! Watch Oceanspirit Dennis and his companions Ray and Mr. Cheeses as they stumble through the plot of Hamlet, order too much room service, and make a general mess out of Denmark. There are lots of combat scenes with an innovative rune engine, and as befits a Shakespearean tragedy, most of the cast dies like mayflies. 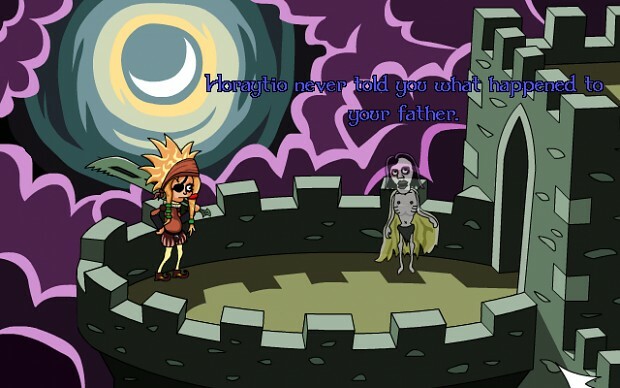 With dialogue written by The Bard himself, how can you resist a game like this? As Guildencheese says, "Squeak!" Oceanspirit Danish - now available! Our Summer Shards action of releasing a game every week continues. This week, we offer Oceanspirit Danish, a creative re-telling of Shakespeare's classic Hamlet. The game is free, fully voice acted, and more than a little silly. Also, for the duration of our summer action, we'll give a 25% discount on our regular games, such as Quasar. This is the Windows installer executable for Oceanspirit Danish, v1.2. This is the full version for Linux, packaged as zip file, v1.2.